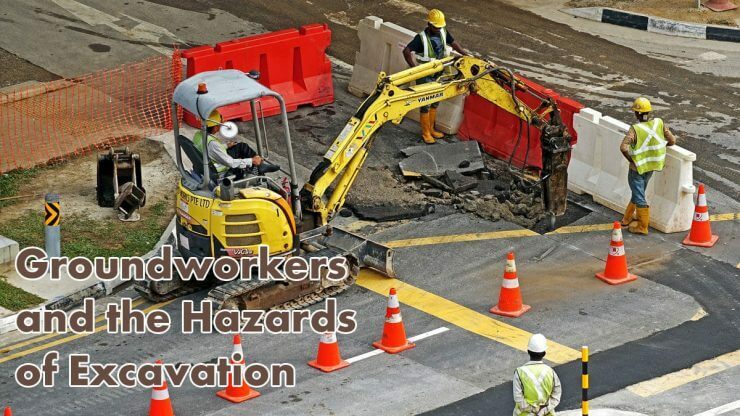 Working in excavation can be an extremely dangerous situation unless you are fully aware of the precautions that need to be taken. Any groundwork should always be carefully planned before being carried out and should be directed by a supervisor. All equipment and materials needed for the job should be available on-site before any work starts. All workers should be competent and as experienced as possible, they should also have clear instructions regarding the work that they are doing. The collapse of the sides of excavation – The most common type of hazard that presents a risk is the collapse of the sides of the excavation. The collapse of the sides of an excavation can be avoided by properly battering and supporting the sides with sheeting and the correct support systems. Before digging any excavation site you should decide what supports will be required and plan the necessary precautions to be taken. Falling materials – Another common hazard is the risk of materials falling onto people working in the excavation site. This can be avoided by ensuring that any materials or soil removed are not stored too close to the sides of the excavation. The extra weight around the site is also likely to add to the risk of the sides collapsing. Falling people and/or machinery – Always provide safe access in and out of the excavation site. If the depth of the excavation exceeds 2 metres, substantial barriers must be placed around the edge. This will help to stop people from accidentally toppling into the hole. Keep any heavy machinery well away from the area being excavated and consider painting the barriers to make them more visible. If you are filling an excavated site using machinery then ensure that you use stop blocks to prevent them from over-running. Water ingress – The ingress of water can cause flooding on-site when excavating. You can take precautions against this by ensuring you have an efficient way to pump out the water and that the water that you are pumping does not cause a flooding issue wherever it drains. Damage to underground cables and pipes – Damage to cable and pipe services during excavation work can cause flooding, electrocution or explosions. Groundworkers should always consult cable and pipe service plans to locate their position, you should also use pipe and cable locators, they should then be clearly marked above ground indicating the type of service, the depth of the cables or pipes and the route that they take. Mechanical digging should not take place within half a metre of the cables and pipes and spades or shovels should be used in place of other tools more likely to pierce through the pipes. The collapse of nearby structures – If an excavation is likely to affect the stability of a nearby structure there are certain measures that should be taken. Ensure the excavation will not affect the foundations of nearby structures, the undermining of nearby structures may cause their collapse into the excavation site. You might decide that is necessary to remove the structure before digging starts or that it needs some temporary support. A survey of the site and the advice of a structural engineer may be needed. Exposure to dangerous atmospheres – Excavations can suffer from poor natural ventilation. Dangerous atmospheres can occur during excavations because of the lack of oxygen or the presence of other gases in a confined space. Adequate ventilation must be provided to avoid the potential of a dangerous atmosphere being created. Thorough inspections of both the work and the excavated site should be carried out regularly and these inspections should all be recorded. Excavations should also be inspected after an event that could possibly have affected the stability of the site. Groundworkers face a unique set of risks every day and so need a flexible insurance policy that protects them against each and every eventuality. Public Liability Insurance for Groundworkers is not compulsory but imperative in providing protection against an insurance claim that you or your company may be found liable for. Ashburnham Insurance provides public liability insurance for groundworkers at a range of depths from 1 to 5 metres including or excluding road surfacing.